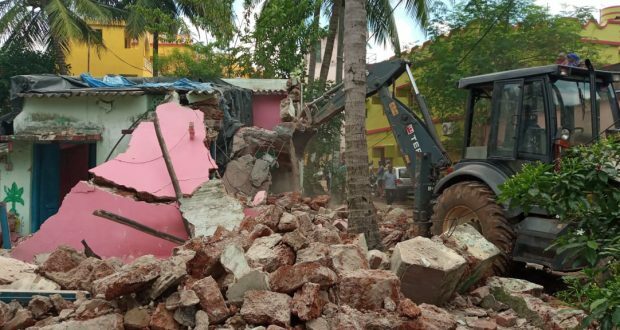 Bhubaneswar:10/8/18; The joint eviction squad of Bhubaneswar Development Authority (BDA) and Bhubaneswar Municipal Corporation (BMC) today evicted a major portion of land at Behera Sahi near Damayanti Apartment in Nayapalli area. The land, recovered through this process would be used for better storage of rainwater, recharge of the dwindling water table of the city and also upkeep of the water-based ecosystem around the Nayapalli Haza and having an efficient drainage network to manage water-logging like situation during unprecedented rains. The eviction process started at around 10.30 am and continued till 3 pm in presence of Nayappali police. Four squads of BDA, one from BMC, two JCBs and two chain-mounted proclain machines were deployed during the eviction work. One platoon of gents APR and one section of lady police force were deployed at the site. Nayapalli inspector-in-charge Umakanta Pradhan was present during the drive along with enforcement officials from BDA. More than 50 houses were demolished during the drive. Bhubaneswar recorded highest temperature iin the month of April this year.